On July 8, 1987, William L. Baird committed suicide on the couple's property. In a 2001 Herald column, his widow spoke of how he struggled with post-traumatic stress disorder. The year before he died, she said, he was signed up for a PTSD inpatient program at the Veterans Affairs American Lake facility near Tacoma. “He was too afraid to go,” she said. A spot near her home, “Bill's Garden,” is planted in his honor. After his military service, he graduated from the University of Washington. He worked for Boeing and the Eldec Corp., but his wife saw him become increasingly isolated. She believes his war never ended. 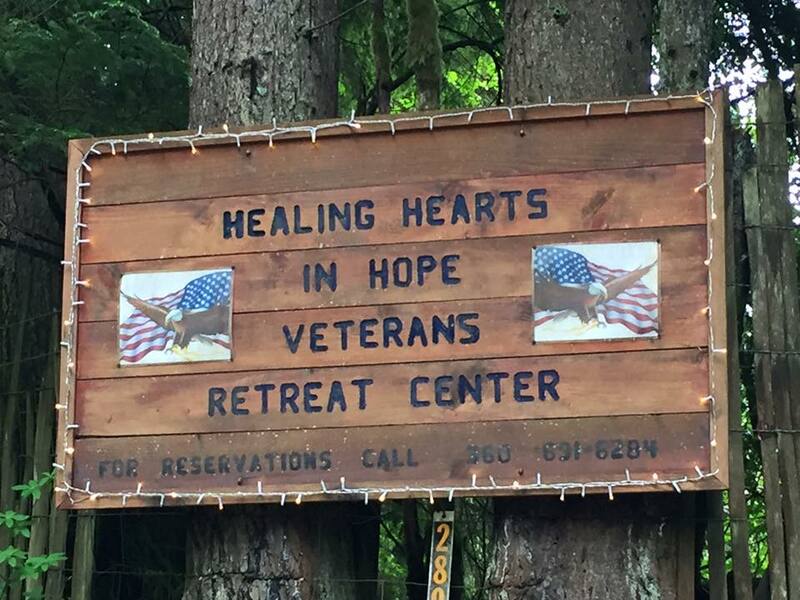 In 2011, Baird opened the nonprofit Healing Hearts retreat center to help others suffering from war's wounds. Seventeen acres of her 23-acre property are set aside as a place of peace, inspiration and healing. There are campsites, a fire pit, the organization's vet-to-vet talking circle, and a small cabin. On Friday morning, the place was buzzing. Down a hill from Baird's house, near an open area she calls “Flying Eagle Field,” about 50 Home Depot volunteers were working in the sun. Most were from the Snohomish store. They were there to build 10 campsites, adding to four already on the site. They also installed 20 picnic tables, expanded a talking circle in a fire pit area, and renovated a small cabin. On May 22, the Healing Hearts in Hope Veterans Retreat Center plans its fourth annual “Spring Fling.” The event, 1 to 4 p.m., is a potluck picnic and gathering open to all veterans. 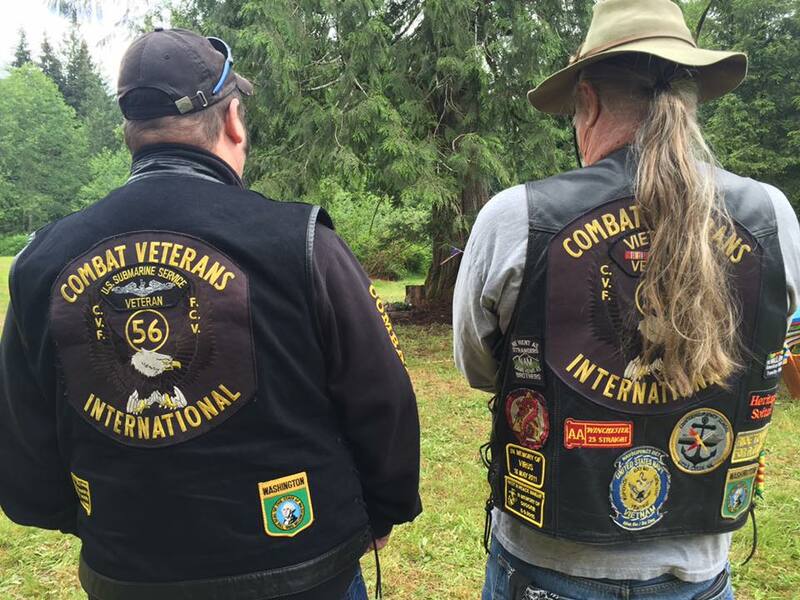 The organization also puts on a veterans appreciation picnic every August. During the Spring Fling, the structure being renovated will be dedicated as the William L. Baird Vet-to-Vet Talking Circle Cabin. Baird said the event has drawn about 60 people in years past, but this time she hopes for more than 200. Jaaron Lauterbach, store manager of the Snohomish Home Depot, said at the work site that Brad Richard came about six weeks ago seeking donations for the project. Richard, a Navy veteran who heads planning and development for the Healing Hearts center, also was there helping Friday. Lauterbach said he put in for a grant from the Home Depot Foundation, which supports the needs of veterans, and found employees to help. Home Depot provided at least $23,000 in supplies for the work, Baird said. An activist for the needs of people with disabilities, she has served on the state's Independent Living Advisory Council and on the government relations committee of the National Multiple Sclerosis Society's Seattle chapter. In 2007, she was given a National MS Society Advocacy Volunteer Hall of Fame award. “I have MS, but it does not have me,” said Baird, also a champion of veterans. She was involved in the state's Welcome Home Vietnam Veterans Day, a remembrance that came too late for Bill Baird. This Flying Eagle believes that all her previous activism, along with the heartbreak of her loss, led her to create the Healing Hearts retreat center. “Come and heal. You don't need to stay in your dark place,” said Nancy Collins, a member of the nonprofit's council, who was also helping Friday. Baird still has the 1966 Chevrolet pickup where her husband ended his life. She would like to refurbish it, and perhaps display it in parades. Why do combat veterans struggle so much with resolving conflicts or coming to terms with many situations in civilian life? One reason may be the issue of "rank." In the military, the troops don't make decisions as equals. You get an order and you follow it. You don't discuss your feelings. You don't hear the reasoning behind the order. You simply obey the one who outranks you. The same is true if you are a leader. When you give an order, you don't expect to explain yourself, or to have to listen to everyone's feelings about your order. You expect obedience. Military members often carry this hierarchy of rank over into their personal lives. We've all heard of military commanders who try to parent their children as though they were in boot camp. That kind of parenting doesn't work well with our own children, and it is especially detrimental to interpersonal relationships. If you care about your spouse, you must value his or her needs and wants, remembering that their viewpoints and insights are just as important as yours. A relationship has nothing to do with rank. Relationships are formed by equals, and putting effort into really getting to know one another. One must put time and energy into exploring the differences between you in order to understand your similarities and visa versa. Another way combat training may interfere with reaching "middle ground" in coming to terms in a civilian situation has to do with human biology. As we strive for peaceful resolution of conflicts it's important to know something about adrenaline-it is the "juice" that drives most of us from day to day. It also gets us into trouble in our relationships. It sometimes overrides our judgment and leads to behaviors and decisions, which may not settle well within a relationship. We came into this world with adrenal glands. Located on the top of each kidney, the adrenals are small glands, which are stimulated by the autonomic nervous system. When we get upset or frightened these glands secrete survival hormones-chemicals which pour into the bloodstream giving us new energy and strength to overcome perceived dangers. This sudden flow makes us stronger and more alert. It also protects us from blood loss, increases our lung capacity, focuses our vision, and directs blood flow away from unnecessary organs to the large muscles of the body. In other words the adrenaline serves to hone in our natural instincts for survival. These physical changes are commonly referred to as the "fight or flight" response. For example, it enables a frightened wife to lift the car off her injured husband, or a terrified person to run long distances for help. With this system fully functioning, our physical capacity to do extraordinary things borders on the supernatural. While this system helps keep us alive in the face of extraordinary danger, it does have one major flaw. The human brain cannot differentiate between a real threat and an imagined one! The brain doesn't notice (or care) if it has encountered something real or a memory that has been triggered from something in our immediate surroundings. Determined to keep us safe, it simply sends out the signal to react, which is also reinforced by military training. The adrenaline flows, and sometimes we may even function with an "out of body" response. Adrenaline flowing from a "false need" can result in a precarious reaction. It can be notably dangerous to our own health as well as those nearest to us. Not only does it add stress to normal body organs-like the heart and circulatory system-but the constant presence of adrenaline can become quite addictive as well. Many trauma survivors seek the next adrenaline "rush" and do not feel complete without the routine experience. This is one of the reasons that thrill seeking behavior after surviving something that has turned on our system is so often the case. Life can be pretty boring without this feeling of vitality, but at the same time this can certainly result in negative consequences if it interferes with ones ability or desire to devote time to a relationship. In relationships, the adrenaline response almost always works against us. Once the process begins, adrenaline is nearly impossible to control-especially after months of combat, where survival depended on adrenaline for prolonged periods of time. This is an automatic response pattern, so it important to be aware of the messages your body receives in order to head the reaction off at the pass. In human relationships the adrenaline cycle can send us down two equally destructive pathways. First, you have heard about the combat veteran who suddenly dives for cover when he (or she) hears a car backfire or fireworks explode. The noise signals danger; the brain, unable to differentiate between a real or imagined threat, initiates the adrenaline cycle. An old imprinted message says move into action to survive. Without thinking the familiar response takes over just like it did in combat; most of the time this response is inappropriate for the situation on the home front. The trigger can be a smell, sound, or any combination of many other sensory perceptions that may be associated with a past injury or threat. When these sudden triggers occur a veteran may suffer tremendous emotional upset. The pain, fear, helplessness, and confusion of horrific wartime experiences might surface immediately. Not to mention the disappointment or embarrassment that may be part of the package. When this cycle happens in the presence of those close to the veteran, they too become affected by these behaviors. I have had many spouses vent their frustration to me about how little they understand about what is happening with their loved one. They feel so helpless to change situations as they arise. In order to obtain a better understanding of the effects of combat trauma it is vital to educate oneself. If family members do not take the time to learn as much as they can resentments may be formed and they themselves begin to move away from the relationship. Not only is education important but the forming of social support amongst others who have similar experiences does much for emotional stability. One very bright young wife also knew that it was important that her husband who was returning from Iraq and she had a therapist in place once he returned. She consulted with me and by the time her wounded husband returned to their hometown he was scheduled for an appointment. It was very rewarding to help them both work on gaining insights into his behaviors, which could have clearly caused a great deal of distress in their relationship had this not happened. Children are certainly affected by the process of deployment. Sometimes both parents are deployed at the same time, and this creates unique and very challenging times for the children, extended family members, friends, and for the troopers who are deployed. Children have many behaviors that can indicate stress symptoms, however this varies according to age. We might see quite a few regressive behaviors such as bed wetting; thumb sucking, feelings of insecurity and being more needy in terms of attention, poor sleep patterns, fearful of being left alone. With older children they may show signs of anxiety or depression in other ways. They may sleep longer, use substances or alcohol, be less cooperative at home, and isolate. These are just some examples but it is clearly not an exhaustive list of possibilities. It is very important for the parents or other adults to help the children understand their emotions, provide support, and not to burden them with the issues best carried by adults. In order to help them discern the difference between reality and fantasy, use language that does not alarm them and monitor the programs they watch on television-including the computer games they play. Teachers are a very good first line of defense also. They are in a position to observe and address the subtle changes in their student's behaviors, school performance and peer interactions. It is vital for parents to alert the teacher of the concerns about their children and the circumstances that could affect them. Family members, as well as those returning from deployment, need to get emotional support from those experts who truly understand the adjustment issues associated with deployments and trauma reactions. Many of the VA hospitals have Deployment Clinics, that are doing their best to streamline the red tape in order to get the service member registered and in the system. They are entitled to two years of care for medical issues through the VA federal system, and it is critical that they get established as soon as possible to assure care. There are also options available for those who are fearful of going into the VA system: Military One Source is good because they can refer the service person to a mental health provider in the community and off base. There are also programs that are available in some states, such as Washington State where I am a provider, who can provide free mental health care to active duty, veterans and their families. So there are options in the community that might provide more security for those who are concerned with the stigmas and negative implications of seeking help. One phenomenon that occurs frequently when an embarrassing episode catches an unsuspecting veteran, or any heavily traumatized person, is "flight." Out of a sense of protection for loved ones, the survivor may withdraw, isolate or dissociate. The resulting distance is a breeding ground for theerosion of healthy relationships. The second pathway is equally as destructive. The flowing adrenaline produces a type of high that was perfectly acceptable in the war zone. That high commonly known as an adrenaline rush can be described as rage. However becoming accustomed to acting out with rage during combat can become an all too familiar pattern in the civilian world. Sadly, these behaviors or violent responses (in times of danger or perceived danger) in civilian environs have incarcerated many veterans and destroyed lives. Over the years of working with combat veterans and their families I have found that the more trauma survivors learn about the dynamics of their experience the easier it is for them to make positive changes. So, in relationships we need to go back to square one and work forward from there. Finally, learning the techniques of reaching middle ground and applying them to situations in life is critical to fending off many negative behaviors and reactions. Searching for, finding, and isolating personal triggers (and perimeter wires that do not allow others to get close) is paramount in achieving peace in our lives. About Bridget C. Cantrell, Ph.D.
Bridget C. Cantrell is a member of the American Psychological Association and Association of Traumatic Stress Specialists. She specializes in trauma with her primary work encompassing therapeutic counseling for war veterans and their families. With a Ph.D. in Clinical Psychology, Bridget is a licensed Mental Health Counselor in the State of Washington, and a Nationally Board Certified Mental Health Counselor. She currently works as one of a small number of specially selected and trained Washington State Department of Veterans Affairs PTSD Contractors. Dr. Cantrell is the founder and President/CEO of Hearts Toward Home International, a charitable non-profit organization dedicated to the recovery and reintegration of trauma survivors. She is the co-author of Turning Your Heart Toward Home, a vital re-integration workbook course for returning troops and families. Her books, Down Range: To Iraq and Back and Once a Warrior: Wired for Life both co-authored with Vietnam veteran Chuck Dean, presents information and resources on PTSD and the various transitional issues for returning troops and their loved ones. In 2004 the Governor's Veterans Affairs Advisory Committee and the Washington State Department of Veterans Affairs appointed her the Outstanding Female Non-Veteran for her service to veterans. Bridget travels extensively around the globe teaching and lecturing military personnel and their families regarding the different aspects of re-integration after experiencing war. Her workshops have been given in both the European and Pacific duty assignments. Please contact her directly to schedule a time when she can work with your unit or organization.